Click here to download a PDF programme in standard print and click here to download an rich text format (RTF) large print programme. Or read on below for the full Calendar online and links to films of events that have already taken place. We are delighted to present the sixth annual Together! 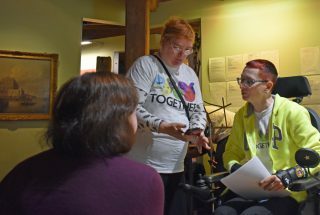 Disability History Month Festival, including the Together! 2017 Disability Film Festival and showcasing the work of Disabled artists from East London, the UK and across the world. Unless specified below, all events are FREE, are open to everyone and are not ticketed: just turn up. This year for the first time we are joining with Newham Heritage Week, the Newham Word Festival and Museum of London Docklands Maritime Festival to programme events jointly, ensuring that even more people enjoy the Together! 2017 Disability History Month Festival. 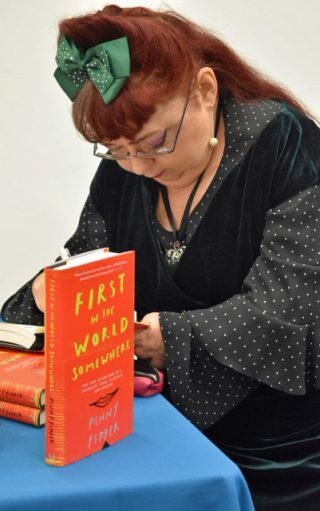 Click here to listen to writer-in-residence Penny Pepper being interviewed by Sky TV on 18 November about her work and the Together! 2017 Festival. Monday 23 October 2017: FESTIVAL LAUNCH EVENT with Anjali Dance Company, currently touring internationally with Genius. 11am: Open Dance Workshop 1.15pm: Join us for a light lunch. 2pm: World premiere of Unicorn, a dance solo by Anjali member Lauren Payne and the launch of our Together! 2017 Disability History Month Festival programme. At Vicarage Lane Community Centre (see below for full venue details). Also part of Newham Heritage Week. MISSED IT? You can watch the video of Lauren’s performance here. Join us on Friday 17 November from 6-8pm for the opening event of the Festival, the not-so-private view of prisong, a new visual poetry exhibition by gobscure at East Ham Library, plus a spoken word event with Sean Burn. Friday 17 November 6-8pm. FESTIVAL OPENING EVENT. 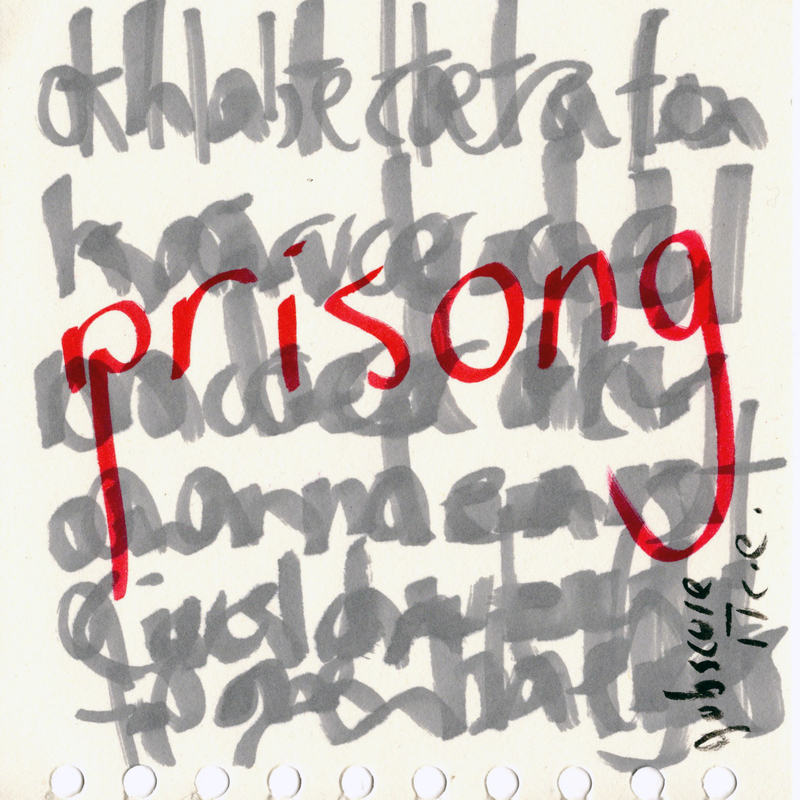 Join us for the launch of prisong, a visual poetry exhibition by Newcastle-based artist gobscure that explores words, the labels we use and the power they have. Includes a spoken word performance by gobscure followed by a question and answer session. At East Ham Library (see below for full venue details). Also part of Newham Word Festival. With BSL interpretation. MISSED IT? Click here to see the film of the full performance and Q&A session (45m,) or click here to view a shorter version (10m). Captioned versions will be available asap. Please email us if you would like to be notified of their release. The exhibition continues at East Ham Library until 15 December 2017. Artistic Director Dr Ju Gosling discusses the performances with Pop-Up Poetry Club members at the Museum of London Docklands on 18 & 19 November 2017. Saturday 18 & Sunday 19 November 12-4pm, performances at 1pm & 3pm: Together! Pop-Up Poetry Café at the Museum of London Docklands Maritime Festival. Read, write and perform poetry inspired by East London’s seafaring history; enjoy three music stages; and discover more about our Docklands heritage. MISSED IT? You can read some of the poems here. Alien Tourists visit Gallions Reach Shopping Park on Saturday 25 November 2017. 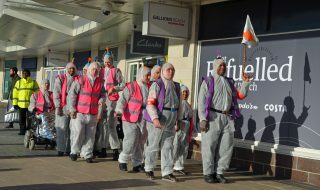 Saturday 25 November 12 noon (approx): Alien tourists visit Gallions Reach Shopping Park. Enjoy the shopping and look out for unusual visitors determined to take a closer look at ‘normal’ people. With Natural Diversions. MISSED IT? You can view a short film here. Friday 1 December 7-9pm: Together! Music Club and Open Exhibition launch. Join us for a festival edition of our monthly Music Club, compered by Ju Gosling aka ju90 with performances from regulars. The Open Exhibition, now in its sixth year, brings together amateur, community, semi-professional and professional disabled artists with a Newham connection and is always a visual feast. At Vicarage Lane Community Centre. With BSL interpretation. ParaCarnival parade through Stratford Centre and perform in the Cultural Quarter on 2 December 2017 to celebrate International Day of Disabled People. 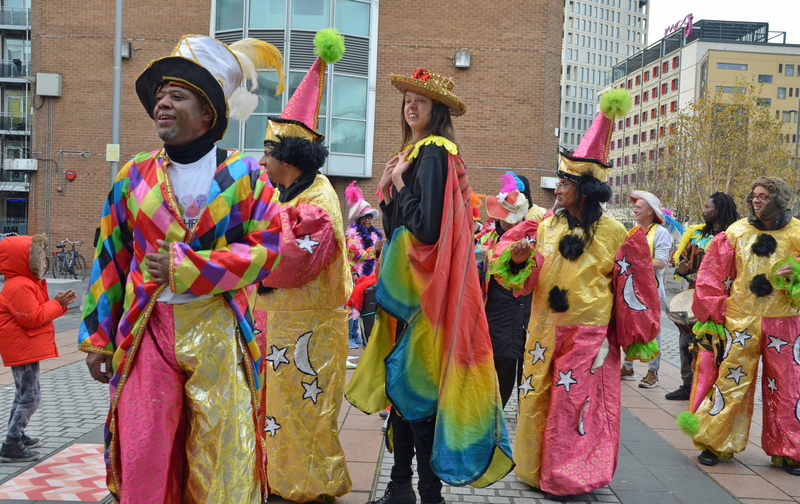 Saturday 2 December 1pm: Paracarnival parade through Stratford Centre to celebrate International Day of Disabled People. Paracarnival bring their unique blend of dance, music and signed song to central Stratford, where you can also pick up bargains from the shops and stalls. MISSED IT? You can view short films here. 7 & 8 December 11am-4pm: Tactile filmmaking workshop for Disabled filmmakers with the Together! Photographers & Filmmakers Club. Find out more about our international Vibrations project, funded by the British Council, and experience and learn to use ‘vibrational sound’ for yourself. With BSL interpretation. Contact film@together2012.org.uk / 07973 252751 for further details. Kills on Wheels opens the Festival on Friday 8 December at 6pm. 8-10 December, 6-8pm (8th); 12-8pm (9th & 10th): Together! 2017 Disability Film Festival. The UK’s only film festival bringing together films by and about disabled people from across impairment groups. The majority of films will be London, UK or World Premieres. At the Old Town Hall Stratford. There will be BSL interpretation for the Saturday lunchtime Vibrations event (12-2pm). Penny Pepper, our writer-in-residence, will be reading a new story at our end-of-festival party on 15 December 2017. Friday 15 December 7-9pm: End of Festival party with performances including a reading by Penny Pepper, Together! 2012 Writer-in-Residence Celebrate the year, the talents of our artists and the coming holidays and listen to a brand-new piece by punk goddess Penny Pepper. Click here to listen to Penny being interviewed by Sky TV on 18 November about her work and the Together! 2017 Festival. Plus Open Mike compered by Ju Gosling aka ju90. At Vicarage Lane Community Centre. With BSL interpretation. Thanks to the generous support of Arts Council England and our sponsors. East Ham Library, 328 Barking Rd, London E6 2RT. 020 3373 0827. Free parking for Blue Badge users. Open 9am-8pm Monday to Saturday; closed Sundays. Stratford Centre, Stratford Broadway, Stratford, London E15 1NG. T: 0208 536 5350. E: info@stratfordshopping.co.uk Nearest tube, overground and DLR stations: Stratford (fully accessible). Bus routes 257, 69 and 308 stop outside Stratford Circus in Great Eastern Road; 25, 86, 104, 108, 158, 238, 241, 262, 276, 425, 473, D8 alight at station. Very limited Blue Badge parking nearby; otherwise use the (old) Stratford shopping centre carpark. Stratford Circus, Theatre Square, Stratford, London E15 1BX. 020 8279 1001. Nearest tube, overground and DLR stations: Stratford (fully accessible). Bus routes 257, 69 and 308 stop outside Stratford Circus in Great Eastern Road; 25, 86, 104, 108, 158, 238, 241, 262, 276, 425, 473, D8 alight at station. Very limited Blue Badge parking nearby; otherwise use the (old) Stratford shopping centre carpark. Vicarage Lane Community Centre, Govier Close, E15 4HW. 0207 420 4986. Nearest tube, overground and DLR stations: Stratford (fully accessible). Street parking. Click here for venue website.